The layout was optimized not only for looks but especially for my prototyping requirements. All Arduino pins are replicated in a standard protoboard / breadboard grid. If no parts are placed but headers the board can be used as a protoboard adapter. All traces are as wide as possible to make etching at home easy. If you buy one this is irrelevant to you. But it also make the manufacturing process less error prone thus reducing the number of wasted boards. 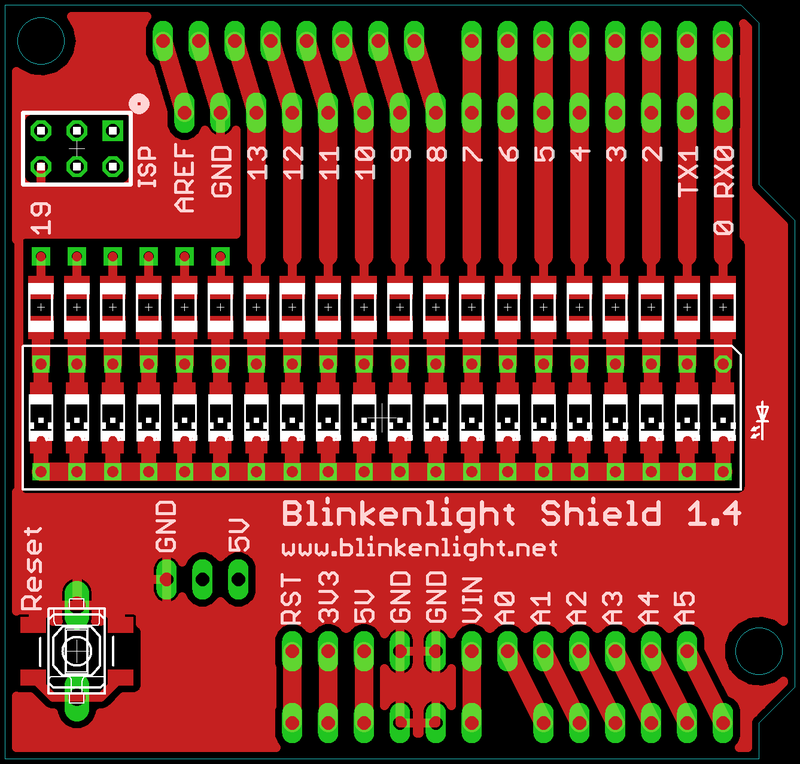 In addition vias were added to allows to place either SMD LEDs or LED stripes. I also included an ISP header. This is because many Arduino boards have the ISP header not soldered. I could solder one header to this board and from then on I would not need to solder an ISP header anymore. Still the default setup is without this header because of the light show aspects. You may wonder why it not allows to place through the hole resistors. Especially since they are often believed to be easier to handle for hobbyists. The answer is that unless you are breadboarding large sized SMD parts are much easier to handle than their through the hole counter parts. Through the hole parts must be properly bend before soldering. They also require holes which you have to drill before you can place them. Soldering of through the hole parts is not faster as with 1206 SMD parts. Even for creating boards at home large size SMD parts are actually faster to handle. 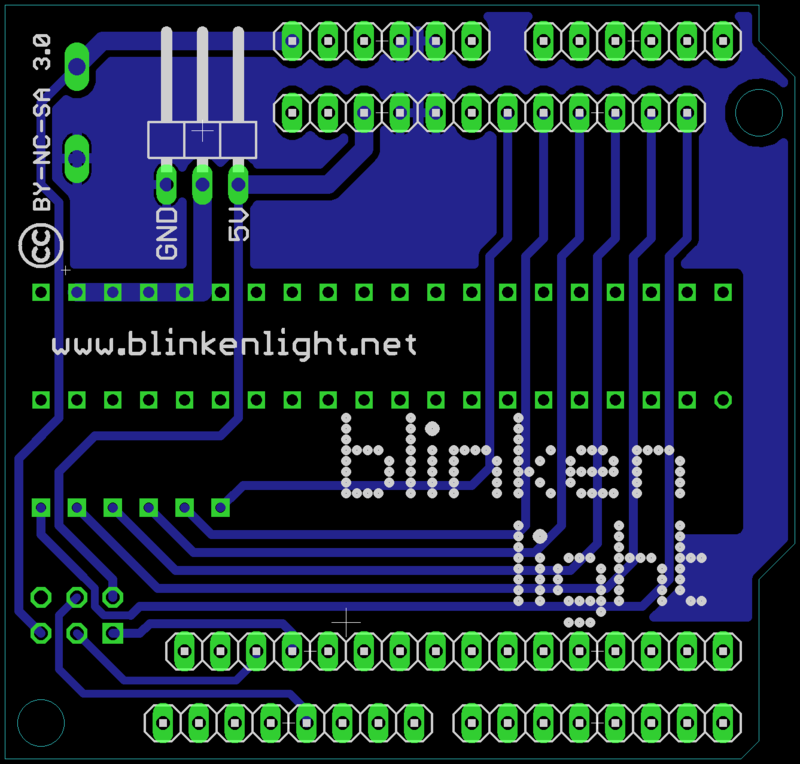 So now that you know what it is you can follow me to the Blinkenlight Experiments in order to learn what it can do.